Express shipping means: If you order in the next 10:23 hours, we will hand over your package today to DHL, our logistic partner. IMMERALLY WARM, FREE HÄNDE: If your child needs you, for example because he/she has lost the pacifier or the Mützchen has slipped, you do not have to take off your thick gloves first, but immediately have both hands free. WITHOUT THE WEATHER: Whether in winter or in the transition period, the wind-, & water-repellent outer cover protects from the elements. Even on very frosty winter days, the lining made of high-quality Coralfleece warms up to the wrists. AUF EVERY KINDERWAGEN: Universal fit for all pushchairs, sibling carriages, pushchairs and buggies with continuous push bar, also with handbrake. DON'T DRESS CLEAN: Velcro fasteners are easier to attach and easier to adjust than snap fasteners. The Thermo-Handmuff thus protects against wind and cold. PFLEGELEICHT: Thanks to the soft fleece lining, the Thermo-Handmuff can also be washed in the machine at 40 °C degrees - in contrast to lambskin. The materials are fast drying. With the Thermo-Handmuff in Grey Melange from Laloona your hands will stay warm and dry during your walk. The upper material is wind- and water-repellent, while the lining made of cuddly soft thermo teddy fleece wraps the hands up to the wrists. You can easily attach the hand muff with Velcro to all pushchairs, sibling or twin pushchairs, pushchairs and buggies with a continuous slide bar. Unlike snap fasteners, Velcro fasteners protect against wind and cold before being pulled in and are better and easier to close. If your child needs you, you will quickly have both hands free to do so, without the hassle of taking off and putting on ordinary, thick gloves. So an absolute must-have for on the way in the transition or winter time that you don't want to miss! 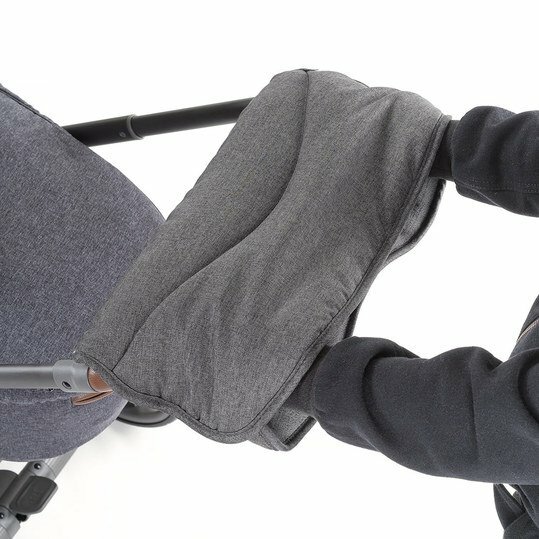 Deluxe Handmuff / Handwärmer für Kinderwagen & Buggy - Melange Grau wurde bewertet mit 3.6 von 5 von 5. Rated 3 von 5 von Schenschifer aus ganz ok!! Haben den Handmuff gleich mit dem Fußsack mit bestellt, leider ist er mit Klett was ich zwar wuste, jedoch bei Benutzung etwas unpraktisch finde! Die Kletti's an den Seiten gehen öfter auf und dem nach kann die kalte Luft rein. Auch wenn sie zu bleiben zieht es etwas durch, aber ich finde auch ohne Handsschuhe noch gut benutzbar! Denke es ist ja eh jeder unterschiedlich empfindlich. Rated 3 von 5 von Minimausi aus Ist okay... Wir haben den Muff für den Winter gekauft. Die Hände bleiben warm. Allerdings löst sich der Klettverschluss ab und zu.